Mother Nature giveth, Mother Nature taketh away. 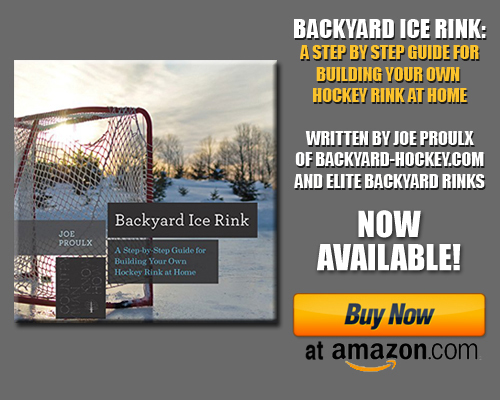 Such is the creed of the outdoor hockey player and backyard rinkbuilder. And, as Patrick Guerette learned last year, the pond hockey tournament director. After consecutive blizzards dropped record amounts of snow in New England, the ice on Messalonskee Lake became compromised and Guerette and Co decided to cancel last year’s Maine Pond Hockey Classic. Guerette and his team regrouped in the spring and planned to not only host the event in 2016, but to make it bigger and better. This year’s event, which will be held on February 12th – 14th at the Snow Pond Center for the Arts on Snow Pond (Messalonskee Lake) in Sidney, Maine, looks to host upwards of 60 teams. To drum up interest, Guerette and his team even produced a series of commercials, seen below. Tournament organizers point out that the Snow Pond Center for the Arts is a great location for the tournament. “When you are hosting players from far away, you want to make sure you think of the entire player experience. This location provides a lot of amenities,” said Bert Languet, Volunteer Director of Event Operations, “we will have lots of parking, drive on access to the ice, and heated indoor space for players between games.” Since inception, the Maine Pond Hockey Classic players has hosted hundreds of hockey players from around the Northeast and even attracted players from as far away as Washington DC and Arizona. The Maine Pond Hockey Classic aims to provide a festival like atmosphere for players and spectators. The tournament site will contain 6 or more rinks, beer garden, fire pits, food vendors and anything else tournament organizers can add to the mix. “We have plans for a few skills competitions for players between games like shooting and skating drills; we also have plans for leisure games as well,” said Guerette. The Maine Pond Hockey Classic offers 7 divisions from players of different ages and ability levels; including, Open “A”, Open “B”, Women’s, COED, Recreational, 40+, and a “College” Division. Each division winner will receive a prize pack including complimentary entry to the following year’s tournament, Championship Sweatshirts, and a very unique trophy that features the State of Maine cut out from old hockey sticks. “We like having a trophy that you won’t see anywhere else; besides, it really wouldn’t be a great representation of Maine if we didn’t take something old and discarded and turn it into something awesome,” said Guerette. The Maine Pond Hockey Classic is an annual fundraising tournament supporting the Boys & Girls Clubs and YMCA of Greater Waterville. Registration opened on October 1, 2015 for the 2016 Maine Pond Hockey Classic, interested teams must register prior to January 12, 2016. Note that the registration fee increases from $445 to $495 on December 1st. Each team plays three pool play games for seeding followed by a single elimination tournament. Tourney games are played 4 on 4 without goalies or on ice officials, and each team is allowed to have up to 7 players on their roster. For those looking to get involved with the MPHC, there are several volunteer and sponsorship opportunities available. If interested, please contact Patrick Guerette, Tournament Director, via email at mepondhockeyclassic@gmail.com. Note: Each year we partner with a number of pond hockey tournaments throughout North America in an attempt to help them grow and expand their reach. This post is part of that partnership.